Leaving Tucson we headed north. Initially I focussed on airfields for my aviation interest: Skydive Arizona near Eloy, Coolidge Mun'l Airport and Casa Grande Mun'l AP. This left no time for any tourist sights (e.g. Casa Grande Ruins Nat'l Monument), but we enjoyed the drive through the desert. The I-10 through Phoenix is a congested artery: gone are the empty roads. 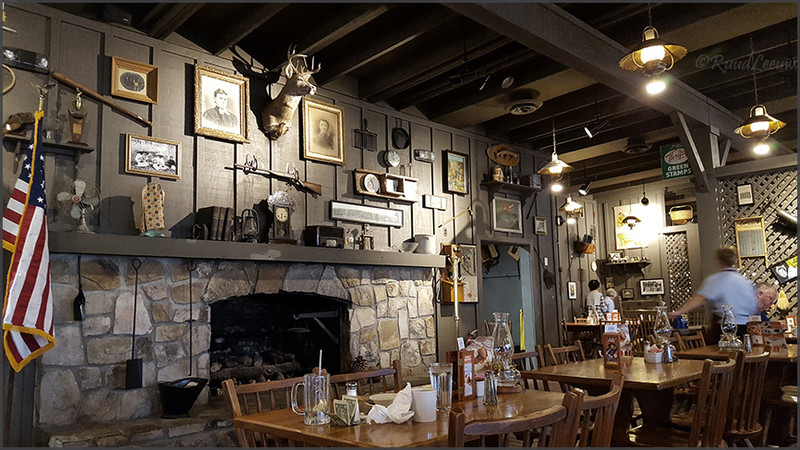 We had a nice lunchbreak at Cracker Barrel ('Old Country Store'). 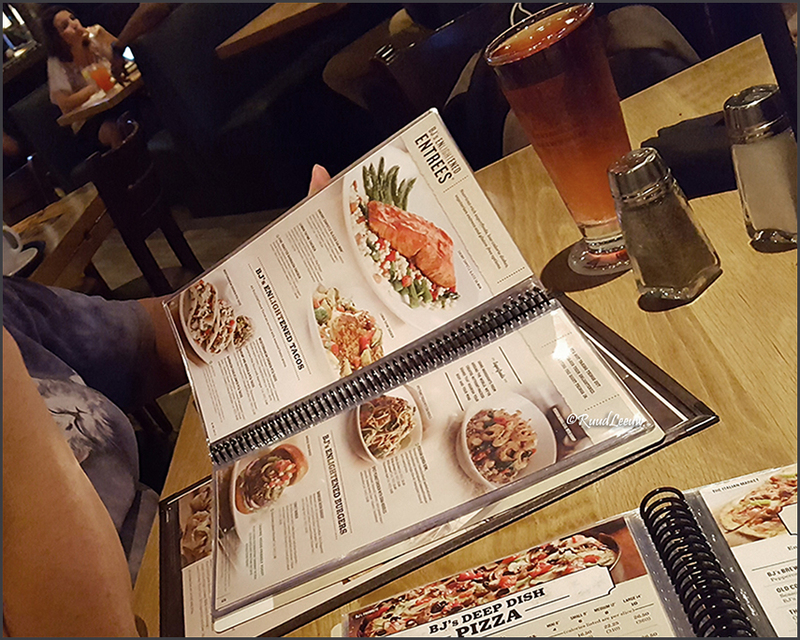 I can add a new name to the list where we like to dine: BJ's Brewhouse! or a stout like Guinness. We like Mexican food too, but most times they only serve lagers. A little out of town is Goldfield Ghost Town. It reminded me of Calico in California, but we enjoyed it very much. Robert F. 'Bob' Schoose was born in River Grove, Illinois and he moved to California with his family at a young age. He heard of the old site of Goldfield (see below, 'Youngberg') and moved to the town of Mesa, Arizona. In 1984, Schoose and his wife Lou Ann, purchased the location of the Goldfield Mill and decided to rebuild and restore the buildings of the old town with the help of various friends (whose names are inscribed in a plaque on the tower) which leads to the town. Schoose incorporated the town as the "GOLDFIELD, GHOST TOWN AND MINE TOURS, INC." He serves as President, his wife as Secretary/Treasurer and Jay Zingler as Vice-President. The town and its historic buildings were revived as a tourist attraction. The town has the only 3 ft (914 mm) narrow gauge railroad in operation in Arizona. It also has numerous shops and buildings which include a brothel, bakery, leather works, a jail, livery, and more. The town is located at 4650 N, Mammoth Mine Road within the jurisdiction of Apache Junction, Arizona. Youngberg is a populated place situated in Pinal County, Arizona. Originally called Goldfield due to the nearby gold mines, The Goldfield Post Office was established on 07Oct1893 with James L Patterson as its first Postmaster. This was the same year that George U. Young arrived. After his arrival, the community also became known as Youngsberg. When the gold mines closed in 1897 the post office soon followed in 1898. The town depopulated, before a new small community developed, and became known under its current name, which was in honor of Young, who was the Secretary for the Arizona Territory from 1909 to 1910. The Youngberg Post Office opened in 1920, and remained until 1926. It has an estimated elevation of 2.024 feet (617 m) above sea level. Endless amount of photo ops! Don't skip the museum, it is more interesting than one would expect. Doc Holiday's Dress Coat. I guess we have to take it on face value. Back to Phoenix, plenty more to see there! Visit to the Phoenix Art Museum, for a photo exhibition, Longer Ways To Go. Danny Lyon, Ed Ruscha, Joe Deal, Stephen Shore, Richard Avedon, Richard Misrach, Christopher Churchill and Scott B. Davis. Pity there was no catalogue of this exhibition for sale. The museum has a very nice gift shop and their café provided a hearty lunch. This collaboration between Phoenix Art Museum and the University of Arizona’s Center for Creative Photography (CCP) resulted here in Longer Ways to Go: Photography of the American Road. This exhibition explores the symbiotic relationship between photography and the folklore of the American highway, including the emblematic Route 66. It covers topics such as the view of nature from a car window and the cult of the automobile. These depictions investigate the extent to which American identity has a sometimes fraught, but always significant, relationship with the idea and practice of the open road. Longer Ways to Go reflects America's cultural habits of consumption, history and leisure; no better way to describe our undertaking of this roadtrip. 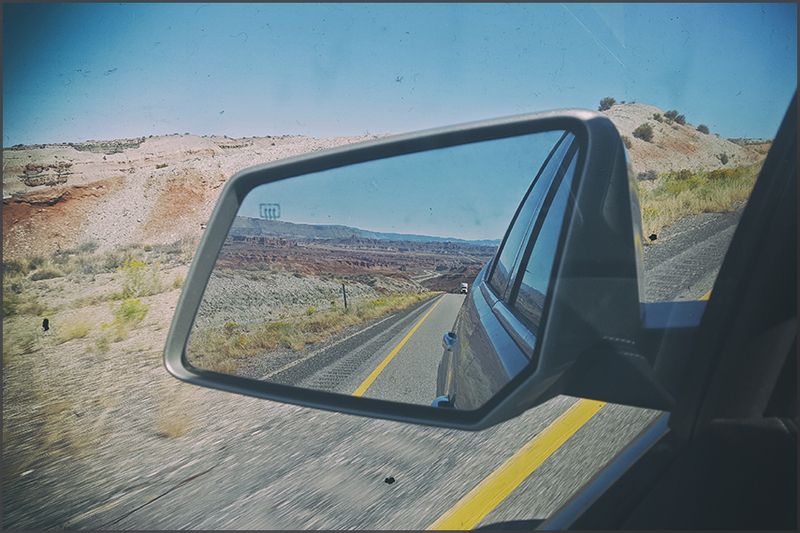 We enjoy the roadtrips, driving endless miles on the open roads and checking in and out in the roadside motels. This tour we travelled 16 days and slept in 11 different motels. The telly has grown less important over the past decades and that is not only because we make use of a notebook, a tablet and our smartphones. We did decide to skip Vegas, but for different reasons. 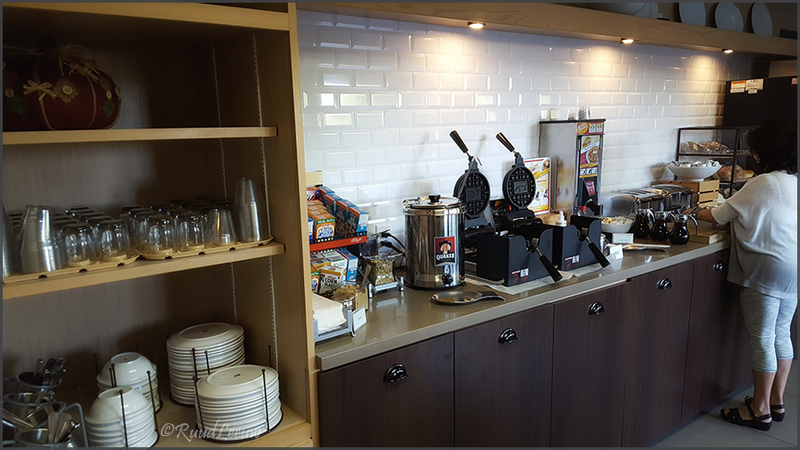 If I remember correctly, this is the excellent breakfast buffet at Country Inn & Suites (Phoenix-Mesa). The only breakfast buffet that offered china and cutlery. They had fresh fruit, yoghurt and I love those waffles. We don't get much shopping done in the deluxe Malls, we both don't care for designer clothing and -shoes. 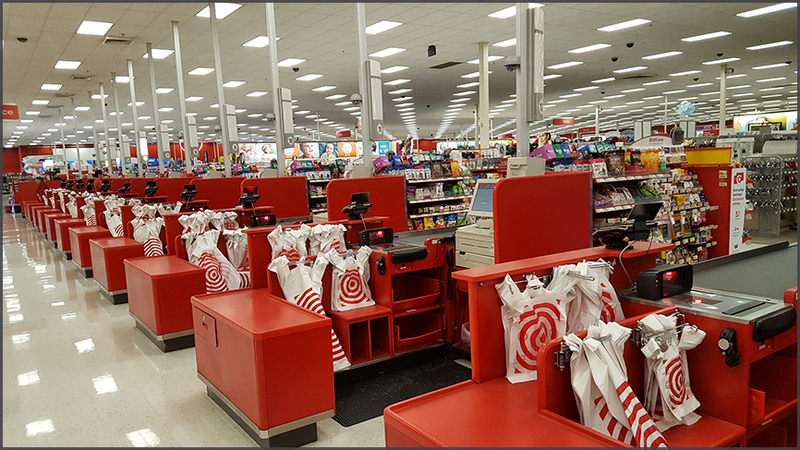 We rather go to Target and otherwise seek out stores with a little more identity. I did see a Half-Price bookstore, but by this time we'd acquired enough books and I managed to restrain myself..
We visited Safeways for Starbucks-in-store. It is also a good place to grab sandwiches for a quick lunch or a bite while driving. From Phoenix we went to Kingman, but for my aviation interest we stopped at Prescott's Ernest A. Love Field Airport. Unfortunately, all the airtankers -for fighting woodland fires- were deployed in California. But we found a nice place to lunch! Driving Route 66 we saw this woodland fire and ground units were close by, monitoring. I think they kept it under control. Good thing the wind was away from the road! Roll down your window and smile. or this flag or this cowboy figurine or this open road. If it could, Route 66 would continue beyond L.A.
We dined at the Canyon 66 Restaurant & Lounge, next to the Ramada Kingman. We stayed at the Super 8 Kingman, in spite of these fine photos a rather sober stay with not much of a breakfast. But o.k. for one night. Pity we did not have time to visit anything here in Kingman, as we had made a change of plan: to revisit Arches NP. We had to accelerate our travel schedule to find the time for a revisit, before flying home from Salt Lake City. Choices to be made. One will see all kind of vehicles on the road: fellow travellers with a little more identity for their car. Lunchstop in St.George to meet up with a friend, Ed Stewart (he has a long and interesting history in aviation). 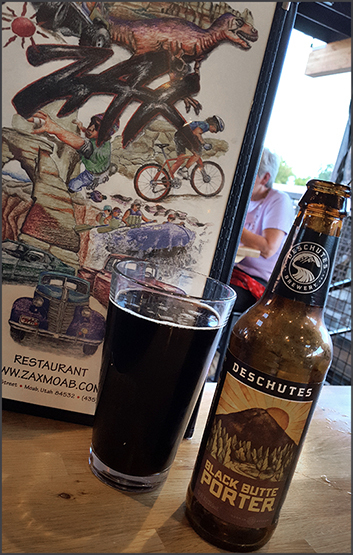 A good place to dine is George's Corner (I can recommend the 'Zion Conviction Stout', an excellent brew!). Walk around for some beautiful art. And don't forget to have icecream from Thomas Judd's Store Co.! Note 'Dixie' there on the mountain..? Ed Stewart clarified it for me: "In the 1850's the Mormon church sent settlers to this area to convert the Indians. They began growing cotton, grapes and tobacco, so were referred to as Utah's Dixie, mainly by northern Utah'ns. One of the later local religious leaders was a former slave owner, but there doesn't seem to be any connection as Utah never really supported the slave states and repeatedly tried to join the Union. The name seems to have been solidified when the locals opened the school and named it Dixie Academy, later Dixie College and Dixie University. The big D on the hillside and the word 'Dixie' in the bluff is historically of much later date and was graffiti by mostly students. Recently the University offered to change the name, but students voted it down. And, by the way, the original missionaries took the Indians farm land and water access so the Indians mostly starved..."
After lunch and meet in St.George we continued on Route 389 to Kanab, with a photostop at Fredonia. The photo stop was somewhat disappointing, for lack of interesting subjects; but perhaps I was in too much of a hurry. Some photos while driving north, to Kanab. 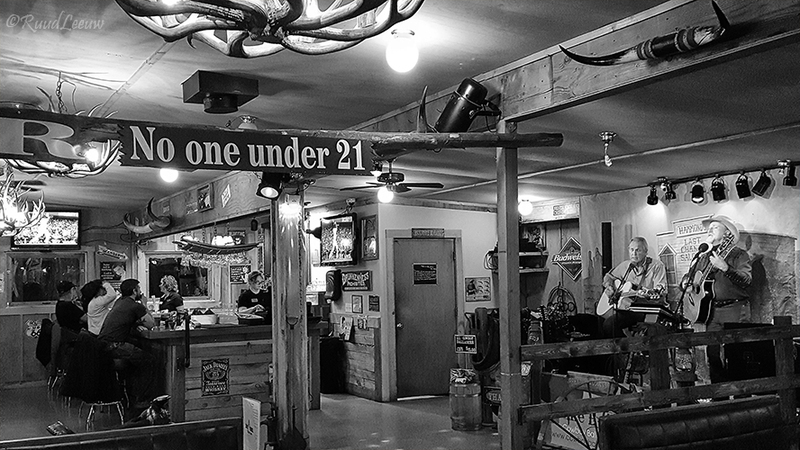 Live music at the Iron Horse, by Mike Ewing ('Cowboy Balladeer'); good food and a fine selection of 'specialty beers'! A really nice place. And it seemed one of the few places offering alcohol with dinner. This is Utah, remember!?! We stayed in the Sun 'n Sand Motel, modest accommodation but due scarcity of places to stay in the area, the one affordable. A bit retro in style, which I like. But no breakfast though. We did that across the road, at a very cozy diner: Big Al's Burgers. Straight Arrow Saddlery in Panguitch, Utah. Another abandoned shop, which I mistook for a gasstation. I think I can read 'WOOD SHOP' and 'HERITAGE'. On the I-70, heading east once again for Moab and Arches NP. Along Hwy 191, not far from Moab. Nice spring colours, the sun warming us during the day but nights were around freezing or even just below! One of two reasons to return here: the first one was flightseeing with Red Tail Adventures, over Canyonlands and Arches NP. Have to look this one up again. The pilot/narrator did tell me (Corona Arch? ), but that was months ago! The confluence of the Green River and the Colorado River. We also flew over Island in the Sky, Deadhorse Point (tragic story) and other places worth noting. Next time, inspite of its vastness, I'll take the car and drive some tracks in Canyonlands. Legislation creating the park was signed into law by President Lyndon Johnson on 12Sep1964. The park is divided into four districts: the Island in the Sky, the Needles, the Maze, and the combined rivers-the Green and Colorado-which carved two large canyons into the Colorado Plateau. While these areas share a primitive desert atmosphere, each retains its own character. As of 2016, the Island in the Sky district, with its proximity to the Moab, Utah area, attracts 76.7 percent of total park visitors. Mammals that roam this park include black bears, coyotes, skunks, bats, elk, foxes, bobcats, badgers, two species of ring-tailed cats, pronghorns, and cougars. Desert cottontails, kangaroo rats and mule deer are commonly seen by visitors. Before the turn of the 19th century, mustang herds ran wild on the mesas near Dead Horse Point. The unique promontory provided a natural corral into which the horses were driven by cowboys. The only escape was through a narrow, 30-yard neck of land controlled by fencing. Mustangs were then roped and broken, with the better ones being kept for personal use or sold to eastern markets. Unwanted culls of 'broomtails' were left behind to find their way off the Point. According to legend, a band of broomtails was left corralled on the Point. There they died of thirst within sight of the Colorado River, 2,000 feet below. 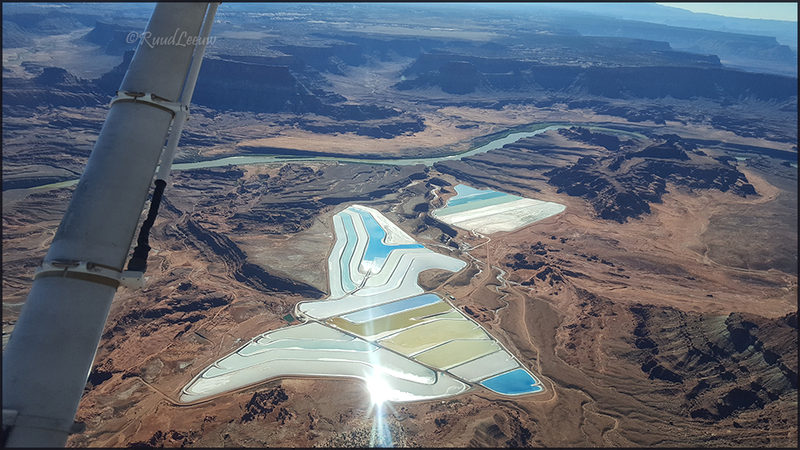 Potassium mining in Canyonlands. A colourful spectacle among the red-brown landscape. We then headed into Arches NP. We see here Turret Arch in the foreground and the Windows Section (two arches) in the center of the photo. Can you make out Delicate Arch? Slightly left of center. That was the second reason for returning here: walking the trail to Delicate Arch! And here we are, hiking to Delicate Arch. This time we carried enough water. Beautiful hike up the mountain. And there we are! Delicate Arch seen from Frame Arch. That last part of the trail I had trouble with my vertigo, but I am glad I made it! An abandoned Diner, by the looks of it. I like taking pictures of abandoned buildings and gasstations, but often cannot stop for them: got a schedule to keep! We took a shortcut from the I-70 to Salt Lake City and got off the Hwy 191 for a look (and lunch) in Helper,UT - a railroad town. With the arrival of the Denver and Rio Grande Western Railroad (D&RGW) in 1881-82, Helper began to develop as a population center. By 1887 the D&RGW had erected some 27 frame residences, with more built later in the year. The railroad planned to make Helper a freight terminal after the rail lines were changed from narrow to standard gauge. The changeover process began in 1889 and was completed in 1891. In 1892, Helper was designated the division point between the eastern and western D&RGW terminals in Grand Junction, Colorado, and Ogden, Utah, respectively, and a new depot, hotel, and other buildings were constructed. On 21Apr1897, Butch Cassidy and Elzy Lay robbed the Pleasant Valley Coal Company, in nearby Castle Gate; they stayed in Helper the day before. It was said that Butch Cassidy later came back to Helper for occasional visits. Helper's growth proceeded in a slow but deliberate fashion bearing little resemblance to booming metal-mining towns. The first amenities offered the few settlers and numerous railroad workers included three saloons, one grocery store, and one clothing establishment. A school was built in 1891. 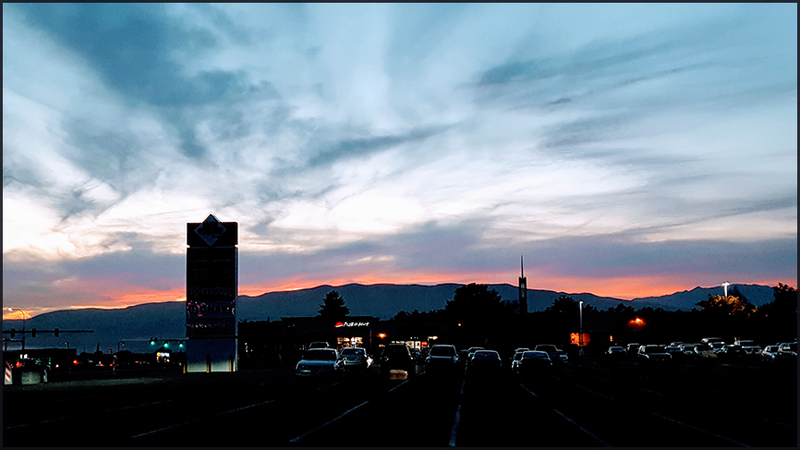 Over the mountains, one more time..
Sunset in Orem, the place we stayed before flying home from SLC with KLM. We could look back on a trip that started with much frustration, but in its entirety was one of the best USA travels in many years.